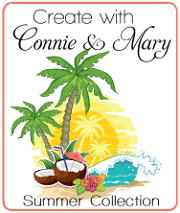 What is Create with Connie and Mary? Well, it is a wonderful subscription service offering Stampin’ Up! lovin’ demonstrators and stampers unique ideas (not seen anywhere else on ‘the Web’) using only Stampin’ Up! products. Each collection of Create with Connie and Mary is based on the release of a new Stampin’ Up! publications such as a Mini Catalog or the Main Catalog and focuses on holidays of a season. The Collections are Spring (Spring Mini), Summer (new catalog), Fall (Holiday Mini), and Winter (Holiday Mini). As Stampin’ Up! has changed their publications of the years, we have updated our subscription service to align with current releases. A four week subscription offers 24 unique 3D projects (home decor, card sets with holder, gifts and more) EACH with a FULL DOWNLOADABLE TUTORIAL!!! Connie and I work to find extremely talented Stampin’ Up! demonstrators to design with us. And our team…AMAZING!!!!! They blow us away each and every collection with their unique talent! Stamping has brought me so many wonderful friendships over the years. Many years ago I was one of a group of women who were asked by Stampin’ Up! to create displays for convention. It was at that time that I ‘met’ (online of course) Connie Babbert. We both had an ‘upline’ in common and over the years got to meet in real life and become friends. Then my friend Connie and another mutual friend open a unique Stampin’ Up! only subscription service called “Create with Connie and Julie”. I came onboard their second edition as a Guest Designer. It’s one of those…”To make a long story short” Julie dropped her Stampin’ Up! demonstratorship and Connie asked me to join her. Create with Connie and Mary was born! It has been amazing to watch this change and grow and we look forward to many more collections to come! Would you like to learn more about Create with Connie and Mary? If so, check out our public website (specific collection sites are password protected for our subscribers only).